For the correctness and completeness of contents provided by other service providers for disposal, in particular start and result lists of shows, we can assume no liability. 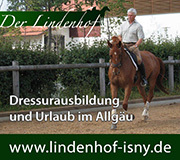 Since we have no influence on the contents or design of linked websites we assume no responsibility for the content of of web pages, referenced by horse-events. This declaration applies to all on horse-events attached links and to the content of the pages to which these links lead. Allows the operator dissociates itself expressly from all contents all linked pages.